With inMotion, the company’s workflow management solution, marketing and creative teams can get content approved 76% faster. inMotionNow, a leading provider of workflow management solutions for marketing and creative teams, unveils a new review and approval tool, the latest update to the company’s flagship SaaS product, inMotion. Along with an intuitive, client-first material design, inMotion’s online proofing environment now offers a collaboration functionality that makes the review and approval portion of the creative production process easier than ever. Traditional approval processes require clients and stakeholders to mark-up printed proofs or provide feedback over email—which requires significant oversight, risks confusion and miscommunication, and often causes project delays. 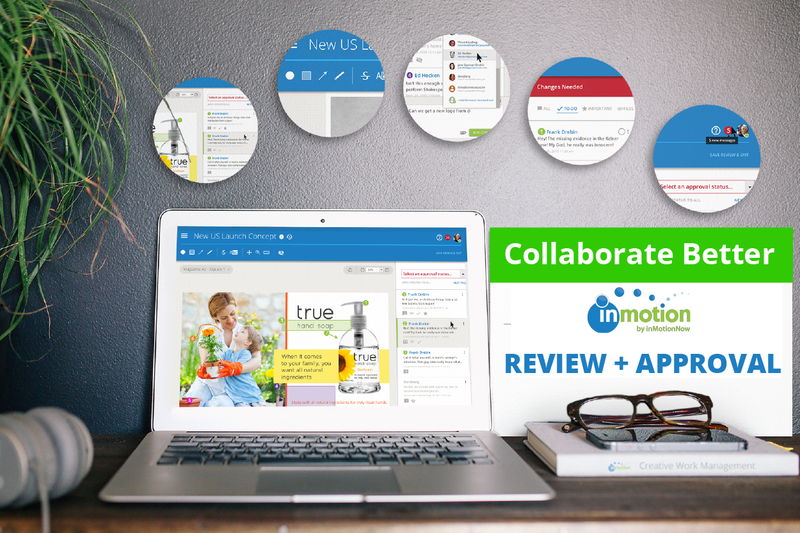 Reviewing proofs with inMotion allows marketing and creative teams to quickly reach feedback consensus; deliver clear, actionable next steps to content producers; and more efficiently collaborate. That means they’re able to deliver more quality content to market faster—and drive more ROI for their business. Clearer Conversations: A new collaboration panel allows reviewers to create comment threads about the proof without cluttering the review canvas. Active Collaboration: Reviewers can see each other’s markups and comments in real-time, and receive notifications when they log in if they’ve been @mentioned in a comment, allowing for live discussions about feedback. Actionable Feedback: Comments can be marked as ‘important’ or tagged as a ‘to-do’ item, making it easy to focus on important, actionable feedback. The announcement of this latest product update comes on the heels of an impressive growth year for inMotionNow. While much of the company’s rapid growth has been organic, the company recently secured a $2 million debt facility and announced the close of a growth round of $3.1 million in venture funding led by Eastside Partners. So far, the financing has been used to add new staff and expand support to the company’s rapidly growing list of enterprise clients leveraging their technology and services, including: Lowes, Lord & Taylor, Staples, Choice Hotels, and Pratt Institute. inMotionNow has also leveraged the recent capital raise to invest significantly in ongoing product development.